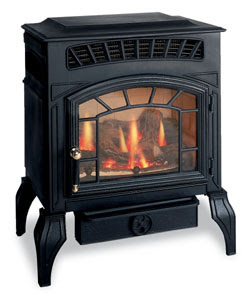 This very traditionally styled stove is the Burley Ambience 4121 Flueless Gas Stove, although traditional in appearance, this stove is by no means traditional in terms of technology. The Burley Ambience utilises catalytic converter technology to eliminate the need for a sometimes costly drafty chimney or expensive balanced flue kit. The catalytic converter in the Burley Ambience causes a chemical reaction in the harmful exhaust gases and converts them into simply Carbon Dioxide and Water Vapor.The only downside to this is that the room must be at least 40m3 with additional ventilation of at least 100cm2. The traditionally designed, cast iron effect exterior cleverly disguises the technical components required to make a gas fire flueless, while at the same time offering a freestanding and aesthetically pleasing stove that would look great sat on a hearth in a fireplace or as a focal point of the room. 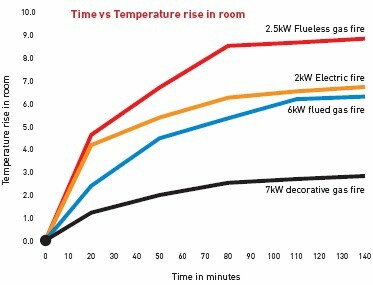 Offering a generous 3.5kw and with no flue or chimney to draw the heat out of the room means that the 100% efficiency of the fire is really put to use when heating the room, this well illustrated in this graph, a 2.5kW flueless gas fire is able to heat up a room far quicker than a conventionally flued appliance and even moreso than the decorative gas basket fires. 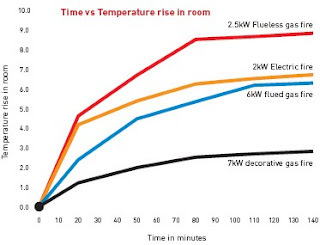 This means that investing in a flueless gas fire becomes an even more attractive option. Higher efficiency means less gas is burnt to give off the heat and no flue heat loss means that, again, less gas is used to bring the room up to the desired temperature, a double saving! The realistic log fuel effect provides an impressive illustion that the Burley Ambience is a real wood burning stove but without a flue. The Burley Ambience 4121 Flueless gas stove is available in both LPG and Natural Gas for maximum suitability for almost any household. Overall the Burley Ambience is a top-quality gas stove that utilises the best of modern technology to create a gas stove that is both traditional in appearance and cutting edge in perfomance and a must for anyone considering a stove without the luxury of a flue or chimney.